Proxima Centauri Vol. 1 Review – AiPT! For those who grew up watching Star Wars, you probably were inspired to create your stories about adventuring through deep space with your own take on a Luke Skywalker-type hero interacting and battling fantastical creatures. Sure, as a child you had a wild imagination and your stories may not have made the most sense, but they are your own stories and nobody, not even your parents, could take that away from you. 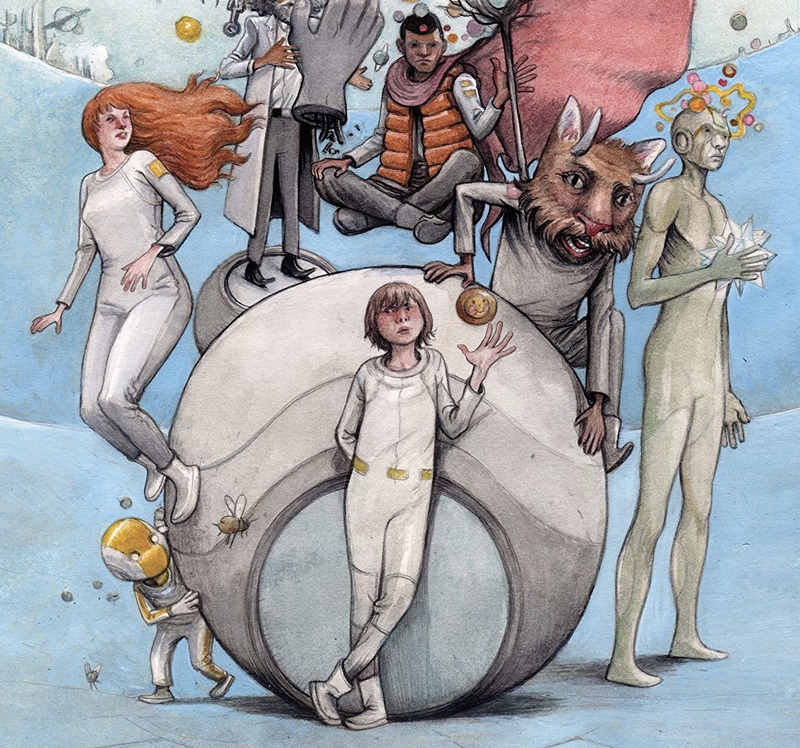 That, in a nutshell, describes Proxima Centauri, the latest title by alternative comics creator Farel Dalrymple. Published by Image Comics, “Proxima Centauri” is also the name of a manufactured dimensional sphere 4.243 light-years from Earth. Looking for escape as well as a way back to his younger brother, the teenage wizard adventurer Sherwood Breadcoat must also deal with his confusing emotions, alien creatures, and all sorts of fantastic dangers, with the help of the most unlikely of friends. That’s the best I can do to simplify this narrative, as throughout its six issues, it just boggles the mind — in both the best and the worst ways possible. On the plus side, Proxima Centauri is a visual marvel as given Dalrymple’s indie background, his visual storytelling is more left-field compared to even a lot of comics published by Image. Reminiscent to the work of Brandon Graham, Dalrymble’s art is a cross between the children’s book art of Maurice Sendak and the French sci-fi surrealism of Moebius, as every page opens a new aspect to this other world, whether it’s new environments or interesting creatures. As much as I can praise the art, it can also be used to deconstruct the limits of the storytelling, because there is so much going on that it’s hard to keep up with what is happening on what Sherwood describes as “a stupid planet, or space station, or whatever it is…”. It’s also hard to say who the book is aimed at — not only are there numerous f-bombs, but the science-fantasy theme, while visually impressive, can go from childlike wonder to darkly surreal imagery. If you strip away the shiny clutter, there is an emotional touchstone that does give the story spark on a narrative level: the central protagonist, Sherwood. He is very much an outsider as without his brother, his social skills are sorely lacking, even when awkwardly befriends the innocent bike-riding Dhog, or tries but fails to go steady with Parasol the ghost. In the end, Sherwood is your typical angry teenager who has to endure the same amount of hell as readers could relate to. This emotional sting may get lost along the way, but there is enough to set up a possible second volume. Farel Dalrymple’s latest is an okay read about the science-fantasy adventures of an angry teenager, but is saved by its stunning artwork. Dalrymple’s otherworldly art makes this a uniquely stunning marvel. ...even if it at times gets lost in the mind-boggling world-building.